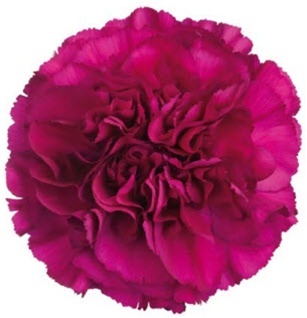 Purple Carnation flowers are a popular flower with a ruffled, ball-shaped bloom. They are known for their color and their hardy qualities. Our premium Carnations are fancy grade or better, meaning they will last longer than most you will find online. They ship fresh and direct from our Ecuadorian or Colombian partner flower farms. Free Shipping! If you care properly for you wholesale Carnations, they should last at least 8 days in the vase. Since your flowers will be shipped direct from the farms, you will be receiving them at the same stage as a flower wholesaler. So they will probably look different than you are used to purchasing. After they have been properly hydrated and put into a state of suspended animation, they ship in dry packs (usually). It is NORMAL for your flowers to appear sleepy and thirsty on arrival. Our Purple Carnations are Fancy grade. Most you find on the internet are the lower, Standard Grade. The difference is that Fancy larger heads, and longer, thicker stems. Average stem length is 20-25 inches. They come in a huge variety of colors. They are easy to work with, using standard floral preparations. Long-lasting Carnations are favorites for use in hotel and restaurant bud vases offering an economical way to enjoy fresh flowers. They should easily last a week or more, especially if you clean the water and re-cut the stems every few days. They're carefully packed in individually wrapped bunches of 25 stems. Carnations ship with tight buds, that will open to a much larger size (2-3 inches) as they rehydrate. Try to schedule their arrival at least three days before your event. Actual colors may vary with computer monitor resolution. Carnations are available year-round from our flower farms in Colombia and Ecuador. Exact varieties may vary with weather and market conditions. Free Shipping!